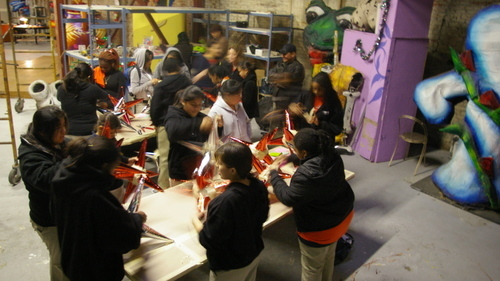 Out of the Rain: Surrounded by paper mache sculptures, middle school students from the Los Angeles Leadership Academy made pinatas at Arts District's Arte Calidad Cultural Institute Wednesday afternoon. The workshop was arranged by Barker Block tenant, Step Up Women's Network, a non-profit organization that taps into community resources for under served girls through a professional mentorship program. Arte Calidad founder Tony Dominguez also lead the tour of the15,000-square-foot facility. 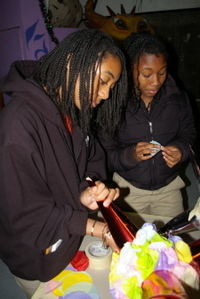 Left: Acorah Williams, 12, from Hawthorne, with Charna Johnson, 13, a resident of South L.A.